There’s no doubt that the property market, like many parts of our economy, is facing challenges at the moment. Uncertainty about Brexit is causing some concern. However, that doesn’t mean its all doom and gloom. All of these reasons still exist, whether house prices are rising or falling. The biggest issue in our local area of Hampshire for many years has been the lack of supply. Due to our excellent commuter links, schools and leisure facilities, properties are still highly sought after. So, if you are planning to sell in 2019, what can you do to maximise your chances of success? Really think about your reasons for selling and what you want. Being focussed on your goal can help you during what can be a stressful process. Do you really need to move house? If so, why? What does your new property need to deliver? It’s your choice what price you market your property at. Estate agents will advise you on what they think is a suitable valuation. You might be prepared to sit at a high price and wait, but if you are motivated to move, considering a lower price to maximise interest may be a better approach. The right estate agent will then be able to work with those buyers to get the best possible value for your home. We always recommend getting at least 3 estate agents round to value your property and talk you through their fees. Check what their terms and conditions are, so you know what notice period you are signing into. Don’t expect to pay more than 1% or agree to anything more than an 8-week contract, to give you maximum control. If you are considering an online estate agent, check whether services like accompanied viewings or For Sale boards are included, so you don’t end up facing unexpected costs. Particularly in winter, it can be hard to make a property look at its best. But you’ll be amazed what a difference a good clean and tidy up can make. Try and keep spaces as light and clutter free as possible, to allow viewers to see themselves in your space. If your property appears well looked after it gives prospective buyers confidence that they are buying a quality property that won’t cause them issues further down the line. Did you know that around one in three property sales fall through within the first few weeks? Being proactive about moving a sale forward can help increase trust at a vital time. Research solicitors as soon as you have put your property on the market and get approximate costs so that you can budget accordingly and be ready to appoint someone as soon as you agree an offer. At Check 4 Houses we are passionate about providing a professional, reliable service which is as stress-free as possible. Please give us a call on 01252 819725 or contact us for a free, no obligation valuation of your property as well further advice and support. You can also download our Selling Guide. From our head office in Fleet, we sell properties in Fleet, Farnborough, Aldershot, Basingstoke, Camberley, Yateley, Farnham and beyond. We can sell your home from just £699 or 0.5% +VAT – saving you thousands in agency fees. What length of estate agent contract should I sign for? When choosing which estate agent to sell your property there are lots of factors to consider. What experience of the local area do they have? What is their track record of selling properties similar to yours? People sometimes get persuaded by high valuations and promises of buyers just waiting to walk through your door. But one question you shouldn’t overlook is what length of contract you will be asked to sign for. Even if you have already decided which agent to go with, always check the small print of the contract. Contact periods can range from 4 weeks to 4 months, depending on the agent. On the one hand, it is only reasonable to give an estate agent enough time to do their job. Drafting sales particulars, conducting viewings and managing negotiations all takes time. Potential purchasers may want to come back for a second or even a third viewing. They may have to wait for their own property to go under offer before they can proceed. Having said that, as a seller you don’t want to get stuck with an under-performing agent. For most properties, the maximum interest is in the first few weeks. As your property comes onto the market, you’ll usually get an influx of viewers and have the highest chance of success. What will an agent be doing if your property is still on the market 2 months later, especially if they have other properties to sell? You don’t want to be tied to an agent who you feel isn’t giving you their best, when you could be moving on with a new estate agent and a fresh approach. We don’t recommend signing a contract for more than 8 weeks. This strikes the balance of giving enough time for an agent to do their job, whilst giving you the control to move on if they don’t deliver. Your agent should be confident that they can achieve what they say and work hard to keep your custom. Why not check out our FAQs for answers to questions such as this to help get your property sale moving? From our Check 4 Houses head office in Fleet, we sell properties in Fleet, Farnborough, Aldershot, Basingstoke, Camberley, Yateley, Farnham and beyond. We can sell your home from just £599 or 0.5% +VAT – saving you thousands in agency fees. Please give us a call on 01252 819725 or contact us and we would be delighted to give you a free, no obligation valuation of your property. Selling your property can be a stressful process. Even when you have accepted an offer, you can’t rest easy. Existing rules mean that prospective buyers can change their minds and pull out at any point until contracts are exchanged. This can leave you financially out of pocket – with solicitor’s fees – particularly on any property you might be looking to buy on the back of your sale, as well as with significant stress and heartache. They don’t even have to give you a reason why. Selling your property is stressful and emotional. When a buyer pulls out it is frustrating. But it isn’t the end of the world. If they weren’t committed to the purchase then ultimately it is better to find out sooner rather than later. The buyer is under no obligation to give you a reason – but out of courtesy, most will if they can. Finding out their reason can be really helpful. For example, if it turns out to be something to do with a survey or a legal issue you can try and negotiate or at least be prepared for it to come up again with your next buyer. It may even be something you can rectify yourself or with the help of your solicitor. If it turns out to be a personal issue – such as a job or relationship change, then you can be safe in the knowledge that it wasn’t your fault. There was nothing you could have done to change the situation and no reason to believe it would happen again. Usually, your estate agent will get your property straight back on the market, reactivating it on Rightmove, Zoopla etc. They will also ring round any other previously interested parties to let them know the property is re-available and to see if they are still interested or in a position to move forwards. If you were planning to purchase a property on the back of your sale your estate agent should advise their estate agents about what has happened. They will ask them to be patient and do everything on your behalf to try and ensure you don’t lose the property you wanted. It’s easy to say – and much harder to do. But rest assured that a professional estate agent will be as keen to sell your property as you are. They will work hard to ensure your sale gets back on track and is ready to proceed again asap. At Check 4 Houses we have managed all sorts of property sales over the past 8 years. Simple sales that sail through with offers accepted in less than 24 hours. Complex chains that finally complete after months of negotiations. Whatever happens along the way we support our clients with personal contact from start to finish and a reliable service. It’s the reason Paul Hemmings started Check 4 Houses back in 2010. He recognised the notorious behaviour of many high street estate agents that sometimes complicated the selling or purchase of a property for customers. He wanted to create a flexible service for customers that was as stress free as possible; offering a personal approach and a cost-effective pricing structure. Spring has always been a busy time for the property market. With Christmas behind us, you might be keen to move before the summer. Springtime marks the beginning of new life – and the beginning of new property moves too. If you are thinking of selling your property this spring, there are things you can do to help improve its saleability. Buying a house is an emotional process, as well as a practical one. Buyers talk about ‘that feeling’ as they walk in the door. Here are 6 top tips to help your prospective buyers get ‘that feeling’ and ensure your house, flat or bungalow is under offer whilst the daffodils are still in bloom. When you live in your house day-to-day, it can be easy to accumulate stuff. But prospective buyers want to see space. Your personal knick-knacks and photographs are important to you, but your prospective buyers need to see themselves living in your home. Think about what you can pack away ready for your move, or do without. Redecorating your property before prospective buyers see it can be expensive. But it is amazing the difference a bit of elbow grease can make. A good deep clean on walls, skirting boards, surfaces, bathrooms etc can leave your home feeling fresher and even bigger. It can make it look and smell more inviting. This time of year the garden can look drab. But a simple tidy up to ensure things are put away or stored neatly can enable prospective buyers to see the space you have available. Cut the grass if you can, or fix any fence panels that might have been damaged over the winter. If your budget allows, popping a few colourful bedding plants in pots or beds just before viewings start can make a big difference. Tap dripping? Lightbulb need changing? Radiator need bleeding? You might not want to start spending lots of money on fixing any problems in your home just before you sell it. However, fixing minor issues that you can resolve can be worthwhile. Changing a lightbulb can transform a room that seems dark into a light filled space. Fixing a blind or curtain demonstrates a home which is well looked after – which inspires confidence in prospective buyers. Fresh flowers might seem an expensive luxury but this time of year you can buy daffodils for just £1. Their cheerful yellow colour immediately brightens up any space and helps people feel happy and relaxed in your property. If daffodils aren’t your favourite then tulips, or any other flowers will have the same effect. Whenever you can (when we’re not going through a spell of freezing weather!) open the windows and draw back the curtains to let light and fresh air in. During winter, it is natural to want to hibernate and keep the heat in. But buyers viewing your home in Spring will be looking forward to summer. Fresh air can encourage them to think of spending those warm summer months in your home. At Check 4 Houses, we know that selling your property can be a stressful and emotional challenge, whatever time of year. We are here to help, offering personal contact from start to finish, from local property experts that know the towns and cities of Fleet, Farnborough, Aldershot, Basingstoke, Camberley, Yateley and Farnham inside out. Our internet based approach means we can sell your home from just £599 or 0.5% +VAT – saving you thousands in agency fees. Please give us a call for a no obligation valuation of your home on 01252 819725 or email info@check4houses.co.uk. 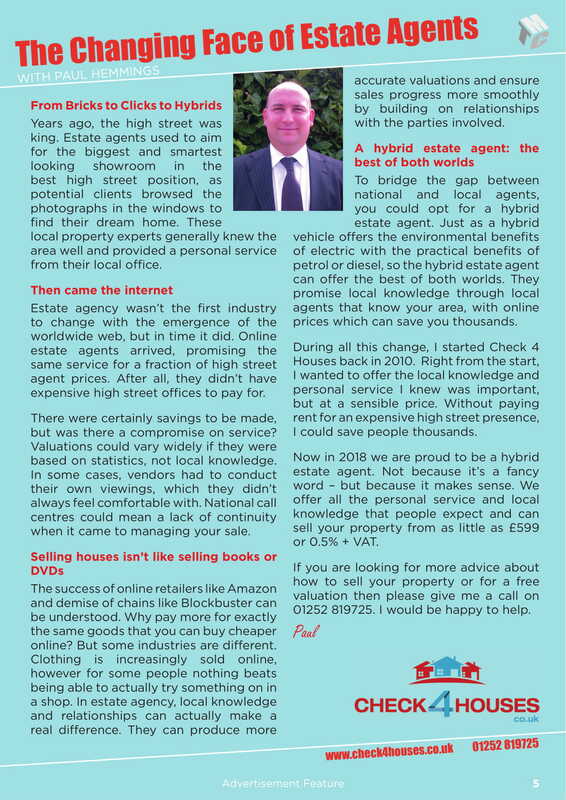 We are delighted to see that Check 4 Houses has again been rated as the top performing estate agent in Fleet by independent comparison website estateagent4me. We are delighted that Check 4 Houses has been ranked again as the best performing estate agent in Fleet. The statistics show we are delivering a 69% success rate of selling homes. We take an average of 33 days to sell properties. We have a track record of achieving 98% of asking prices. 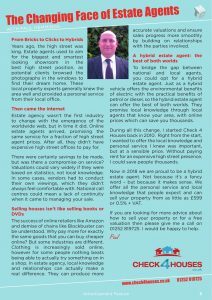 At Check 4 Houses we deliver a genuine, reliable and professional house selling service for up to half the cost of a traditional high street agent. From our head office in Fleet sell properties in Fleet, Farnborough, Aldershot, Basingstoke, Camberley, Yateley, Farnham and beyond. We can sell your home from just £599 or 0.5% +VAT – saving you thousands in agency fees. Please give us a call on 01252 819725 or contact us and we would be delighted to give you a free, no obligation valuation of your home. In conveyancing, the property is legally transferred from the buyer to the seller, or vice versa. In this guide we will look at the key steps involved. The process is similar if you are buying or selling. In this article we we will focus on the process of selling your property. Once you have accepted an offer on your property you will need to find a solicitor or conveyancer to complete the legal process on your behalf. It helps speed up the process if you have already decided which one you will use. You can do this as soon as you put your house on the market, then formally instruct them to start work once you have accepted an offer. You must complete a number of detailed questionnaires about your property. They are standard forms which will be provided to you by your solicitor/conveyancer. The forms include information on boundaries, utility providers, fixtures and fittings to be included etc. It is really important you complete them as truthfully as possible and take the time to do so. Your solicitor or conveyancer then writes up a draft contract and sends this to the buyers for approval. At this point there may be some further negotiation between you and your buyers about date of exchange and completion. You may also need to negotiate any payments for fixtures included, and any issues arising from their survey or home buyers report. 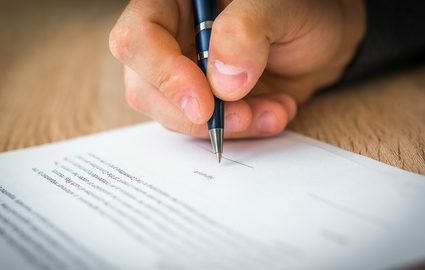 Once you and your buyer have agreed on all the details and a date and time to exchange contracts, your solicitor or conveyancer will exchange contracts on your behalf. This is usually done by both solicitors/conveyancers making sure the contracts are identical. They then immediately send them to one another in the post. Remember, once you have exchanged contracts you are now in a legally binding contract to sell the property. You can no longer change your mind or renegotiate, without risk of being sued. After exchange of contracts you should receive the buyer’s deposit – usually 10% of the property price. However if you are purchasing another property at the same time, your solicitor may hold this on account for you. They will use it to pay the deposit on the property you are purchasing. Completion day arrives! Once you have packed up and done a final clean it is time to hand over the keys. Usually your buyer collects a set of keys from the estate agent. You leave any spare sets and other keys in the property. Your solicitor or conveyancer will receive the outstanding balance of sale price. 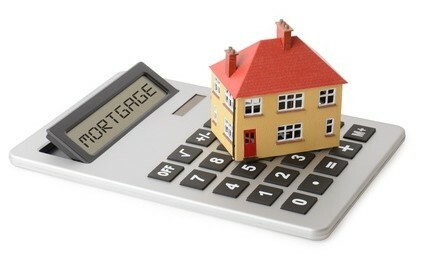 Any outstanding mortgage on the property can then be paid off from the proceeds of the sale. Your solicitor hands over the legal documents that prove that ownership has now been transferred and the process is complete. You can find out more about what to expect from the conveyancing process from websites such as The Money Advice Service or The Home Owners Alliance. They also have tools to help you find a solicitor or conveyancer. Your estate agent may also recommend people they work with regularly. At Check 4 Houses we are passionate about supporting people through the sometimes stressful and emotional challenge of selling their property. We offer personal contact from start to finish, from local property experts that know the towns and cities of Fleet, Farnborough, Aldershot, Basingstoke, Camberley, Yateley and Farnham inside out. Our internet based approach means we can sell your home from just £599 or 0.5% +VAT – saving you thousands in agency fees. Please give us a call for a no obligation valuation of your home on 01252 819725 or email info@check4houses.co.uk.